When it comes to shopping for light fixtures, it's good to know what you're looking for first. There are so many different trends, styles and looks you can find that you might be overwhelmed with options. First know if you're looking for wall sconces or a ceiling light like a pendant or a chandelier, then narrow your search down by look. To get you started, check out ten of the best online sources for lighting fixtures, including modern luxury lighting from Lumens, incredible antiques from Good Olde Things and stylish, affordable pieces from places like Lamps Plus and Shades of Light. From flush mounts to wall sconces, chandeliers and pendant lights, Shades of Light carries a huge variety of figures in just about every style and trend you can think of. 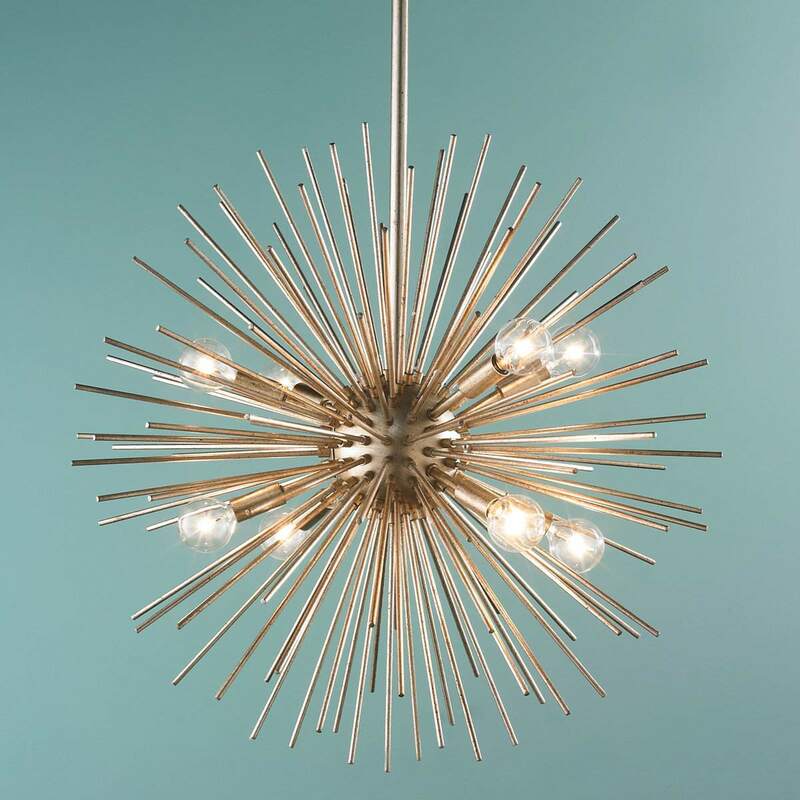 You'll find modern chandeliers that look like stars, Mid-Century Modern drums and brass and glass sconces for both indoor and outdoor lighting. Prices vary, with sconces starting at $21 going up well over $200, and chandeliers starting at $100 and topping out at more than $5000. The largest and most egalitarian source for all things lighting, Lamps Plus does indeed carry more than just floor and table lamps. Frequent sales online mean you can often find a great deal, and many of their sconces and mini pendants, and fun, artful shade wall lamps. We love that you can find a shade pattern you like and shop it in a variety of styles like pendants, sconces and table lamps. Prices start under $25 and get up into the multiple thousands for major chandeliers. We turn to Home Depot for all of our home renovation needs, but even if you're not going through a full gut remodel, you can use their selection of lighting fixtures to spruce up the bathroom, your vanity station, kitchen and more. Many of Home Depot's items ship free, or can be picked up in-store, and their prices are some of the lowest and most reasonable, with things like 4-light chrome mounted fixtures for under $100 and track lighting fixtures under $150. You can even find chic, industrial chandeliers for less than $200. We love Lumens if you're searching for stylish name-brand lighting fixtures from brands and designers like Jonathan Adler, Kartell, Herman Miller, and Knoll. With so many high-end brands, Lumens tends to be on the pricier side. Expect prices to start around $200 and go up from there. Like Home Depot and Bed, Bath and Beyond, Lowe's is a great resource for practical shoppers who want lighting fixtures that look cool, do their job and don't cost a fortune. Do-it-yourself home renovators will find all the cabinet lighting, recessed fixtures and track lighting they could dream of, and those who want to play more in the design space will find pendants, chandeliers and wall sconces to fit their vision. Lowes has a great online feature as well that allows you to shop by trend inspiration like industrial, vintage and French country. For exciting, interesting and unusual lighting fixtures, Arhaus should be at the top of your list. Pendant lights with shades woven from rattan or wire, elaborate brass sconces, and cut-crystal flush mount fixtures are all created in partnership with family-run businesses and using centuries-old techniques. Due to the handcrafted nature of their products, prices are on the higher end. Bed, Bath and Beyond is an amazing brick-and-mortar and online resource for all things home. They offer a great selection of basic lighting fixtures at affordable prices, including wall lighting, sconces and even playful, colorful chandeliers for less than $80. BB&B is a great option all around, some online digging will reveal all kinds of trendy and classic lighting fixture options for much less than some other home retailers. Horchow has some of the most artful and interesting lighting fixtures we've seen. We particularly love their selection of luxe sconces—sprays of gold metal, crystal waterfall designs and antique-inspired deco pieces, which run the gamut from about $300 to nearly $2000. If you're looking for a piece of truly vintage lighting, Vintage Hardware has a curated collection of fixtures that have been restored from the 1930s, 1960s and more iconic decades. Due to their rare status, these vintage and antique fixtures start at about $350 and go as high as $1450. In the market for a 1970s crystal chandelier from the Waldorf Astoria? For $22,000, it can be yours, thanks to one of our favorite "window shopping" sites, Olde Good Things. Of course, you can find tons of more affordable vintage and antique lighting fixtures too, but you should still be prepared to pay for the high-quality and rare status of these pieces.